After missing the Big Dance for the past three years, the San Diego State men’s basketball team will face Houston in Wichita, Kansas on Thursday. 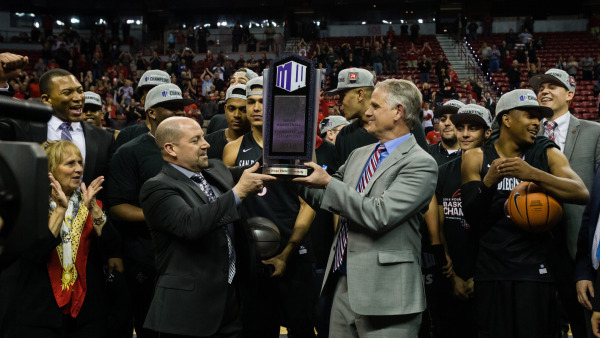 The Aztecs (22-10), which earned a berth to the NCAA Tournament after beating New Mexico in the Mountain West Basketball Championship on Saturday, were seeded No. 11 in the brackets announced Sunday by the NCAA. San Diego State finished fourth in the MW regular season. Houston (26-7), which was seeded sixth, lost Sunday to Cincinnati in the AAC tournament final. The Cougars ended the regular season in third place in the AAC. If SDSU wins against Houston, it will play the winner of the Michigan-Montana game Saturday. The winner of that game will play in the West Regional at Staples Center the following Thursday. Tip-off will be at 4:20 p.m. Pacific time and the game will be televised on TBS. Meanwhile, the Aztecs home court, Viejas Arena, will play host to four NCAA games, two each from the East Regional and Midwest.